Are in-between spaces in offices more important than desks? Can a neighbourhood work without great public space? 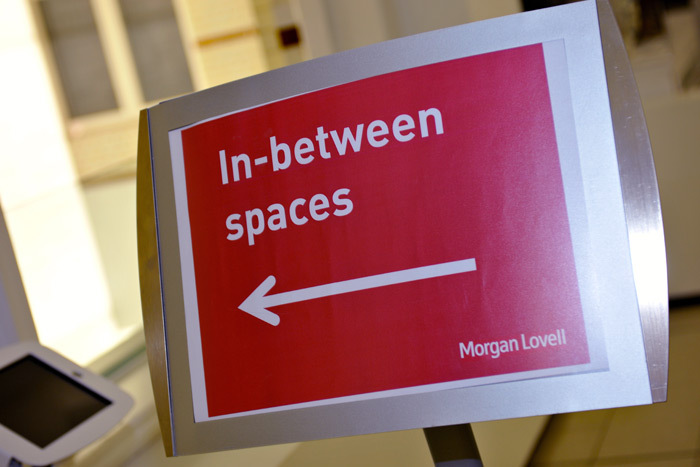 Veronica Simpson joined the debate at Morgan Lovell’s latest seminar. Of course, the idea of 'in-between' spaces is not new. Giannini cited the writings of Ray Oldenburg (author of the 1989 tome The Great Good Place), where the importance of 'third spaces' was promoted. Oldenburg had a list of qualities he felt defined the best 'third spaces'. They should be available for all, status free, friendly, welcoming, and encourage informal meetings and chance encounters. They often revolve around food and drink -we all know that the cafe, bar, pub, coffee shop or restaurant plays a vital role for offices and communities. Giannini cited the pioneering work of DEGW (now part of AECOM) and its founder Frank Duffy in busting the myths of how effectively traditional work spaces operated. Giannini showed some interesting charts that revealed how much time employees in a variety of professions spent away from their desk while in the office - an average of 20 per cent of the working day. But what the charts didn't reveal was where they were. Having a quick smoke? 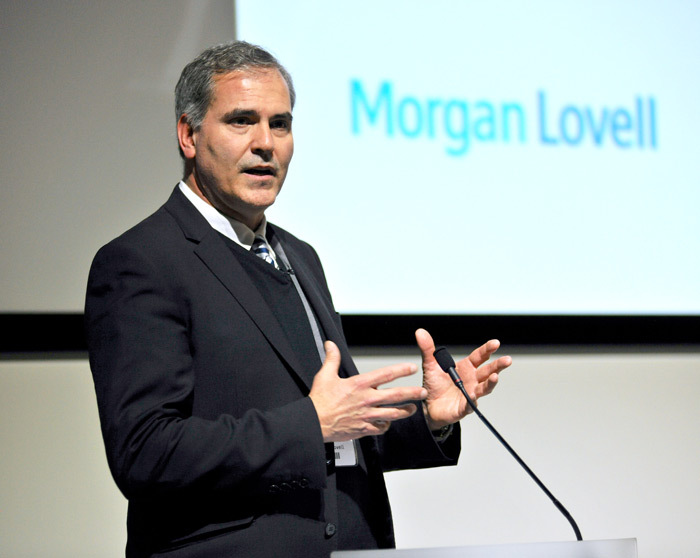 Morgan Lovell's MD Ken Giannini was the first speaker at the company's first seminar of the year. Fetching coffee? Sneaking a quick 40 winks in the loos? With an accompanying slide show demonstrating some very different 'in-between' spaces that Morgan Lovell had created for clients, ranging from glamorous, quirky, chic or slick for everything from trendy media companies to footballing empires - the implication seemed to be that the better your third space options, the more likely it is that your staff will spend that 20 per cent of non-desk time productively. Two excellent speakers were lined up to assist Giannini in demonstrating the benefits of interstitial encounter. Nick Searl, a partner at King's Cross developer Argent, took the debate's audience through the slow and considered creation of places and spaces that are helping to manifest a sense of identity and community for the emerging piece of city behind St Pancras International and King's Cross Stations. And Simon Allford, director at Allford Hall Monaghan Morris - creator of Google's forthcoming new headquarters (also in King's Cross) - was able to whizz us through many different office evolutions, the most successful of which, he believed, are always those that encourage serendipitous interaction and encounter. Argent's Nick Searle with architect Simon Allford, director at practice Allford Hall Monaghan Morris. Searl, who trained as an architect, says that he never depicts King's Cross to potential occupants as just so many square metres of facilities. 'What I've presented is a place,' he says. 'I've tried to present a story that will enthuse people to see this as one of their options.' And for him - despite the 23 office buildings, 17 residential buildings and 46,500 sq m of shopping that is promised for the site - 'it's all about in between spaces'. To demonstrate, he threw up some stats: of the 67 acres of land sitting behind the two big stations, 56 per cent of it is in-between space. Though Searl wasn't at Argent when the developer bought this former densely industrial part of London, filled with train sheds and a major gasworks, he traces Argent's most inspired placemaking initiative back to the decision to avoid putting pen to paper after acquiring the site in 2001. Says Searl: 'For a year Argent avoided the temptation to start drawing anything.' Instead, it talked to a lot of different people in order to evolve a manifesto, comprising 10 'principles for a human city'. Argent fine-tuned the layout of routes and resting spaces through and around the site, with the help of urban design expert Space Syntax, to maximise the flow of people and traffic between the station and maximise productive use of the areas around them. Then it started animating parts of the site with public art, events (open-air theatre on the former Gas Works site, for example) and street food markets in order to create traffic and something of a buzz. The massive investment and improvements to St Pancras International (completed in 2007) and King's Cross Station (2012) added a huge amount of momentum in drawing visitors to the site's threshold. Simon Allford highlighted the importance for placemaking of retaining and enhancing some of the historic buildings from King's Cross past. But the pivotal moment in drawing people away from the stations and deeper into the site was the opening of Central Saint Martins' new campus, in The Granary, with Stanton Williams inspired refurb completed in 2011. Its own piece of public/private space, Granary Square has become a popular destination not just for occasional large-scale outdoor performances, but also on an everyday basis, attracting everyone from office workers eating their sandwiches by the canal to parents with toddlers taking advantage of the fountains on hot summer days. Since then, several more pieces of public space have opened up, and more are yet to come. Searl took us through a montage of all the different in-between spaces planned for the area - all very varied in mood and offer, from formal gardens through large squares to small, contemplative alcoves. There will even be a natural pool that opens at the north of the site this spring, which will operate as a public swimming facility for at least two years, as part of an Argent-backed public art scheme by Marjetica Potrc and Ooze Architects. There was one point about in-between space that Searl was most emphatic on: that it's all very well dreaming up these diverse promenades, amphitheatres and crannies for people to inhabit, but curation is key. 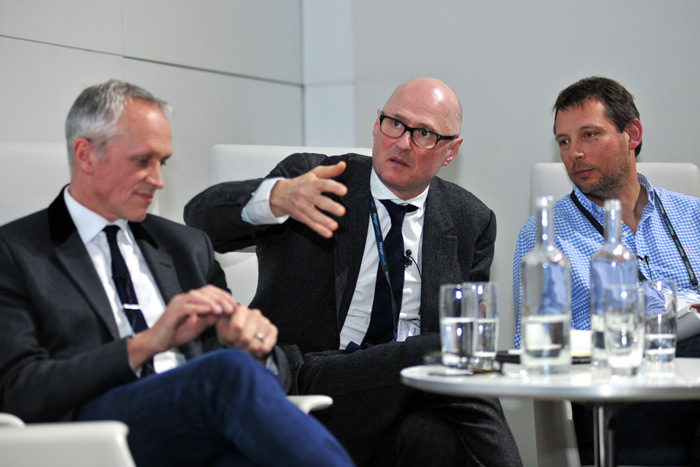 'Curation is absolutely vital and quality is paramount. We curate these spaces through the year.' Food is 'a great communicator' he said, pointing to the street food market that spreads up the route from the stations to CSM, as well as the recent 'skip garden cafe' up to towards York Way. Having a good mix of people using the space is also crucial in making it feel like a real piece of city, not just the creative techie types that will be using the new Google building. The student and teacher population of CSM is a big asset in animating the streets with vibrant, flamboyantly dressed fashion and design acolytes; it has certainly helped in attracting cultural organisations including the Finnish Institute, PRS Music and the Art Fund, now resident there. But Camden Council is also moving in. And London families will also soon be visible - not just playing in the fountains in Granary Square, as has become a popular summer pastime, but also occupying the primary school due to open in September in one of the tall residential buildings. 'That is going to enliven these spaces even more,' said Searl. From the macro to the micro, Simon Allford did a great job of drilling down into the subject of how to inject more social glue into workspaces through in-between areas. 'Social exchange is just as important as the boring conversations you have over the internet,' he said. His presentation took us on a whirlwind tour of big visions and leading thinkers of the past, from Samuel Pepys' musings on the role of the coffee shop as the workplace of the 17th century through Cedric Price's 'fun palaces' to Buckminster Fuller's futuristic visions of great glass bubbles grouping together urban communities that would then adapt according to the cultural ecosystem that evolved. His theme was all about 'flexible inhabitation', 'long life and loose fit'. The look of adaptable, creative, sociable workplaces could be extremely varied, he showed us, from the MIT aircraft-hangar of a laboratory space that produced several Nobel laureates between 1943 and 1998 to the Tea Building, a Shoreditch warehouse developed by Derwent in the economic doldrums of the first decade of this century that was refurbished and inhabited, layer by layer, floor by floor, with each evolution adapting the space to its own requirements. The seminar's audience had the chance to put questions at the end of the seminar. The new Google HQ, he told us, will offer promenades and connections, in an architecture 'that mirrors the street'. It will have a soft side (for play) and a hard side. 'For Google we are developing the idea of a space you can reconfigure for yourself.' He showed us images of collapsible, reconfigurable partitions and alcoves that could be easily adapted to whatever a meeting, group discussion or private work space demanded, putting the power in the hands of the users. 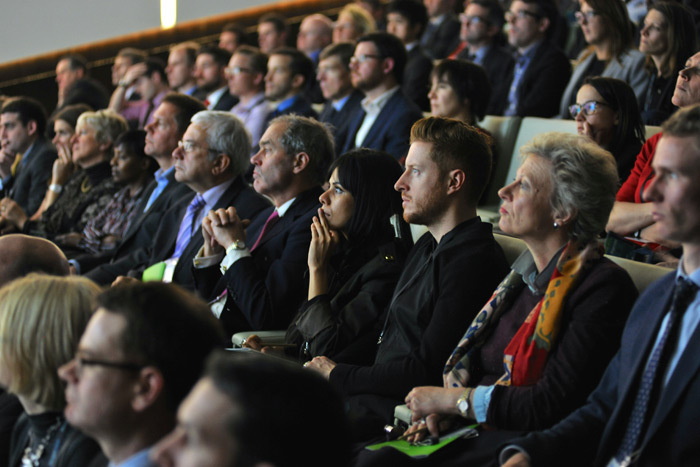 Joe Borrett, director of real estate and construction for Google UK, was actually on hand for questioning after the talks. Google of course is famous as the company that first hit the design headlines with its 'office as playground' schemes incorporating slides and pods and beanbags. 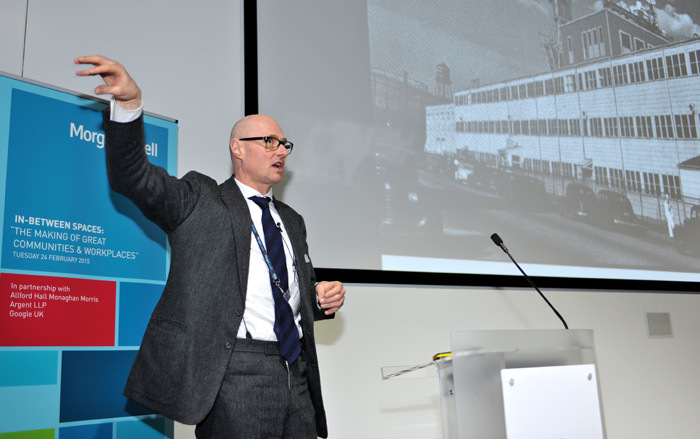 Borrett didn't give much away about the future King's Cross site, though he was enthusiastic about the possibilities of gathering data on how people use space. He admitted Google had started using digital analysis of behaviour in in-between areas in order to evolve mini-scenarios for future uses (does anyone else find this a slightly sinister idea: that a company is tracking its employees and observing their behaviour at all times?). But the big reveal came when Borett was asked: 'How important are in-between spaces to Google?' The answer was as shocking as it was brief. Google, it turns out, believes in desks. There is a desk for every individual in the office, he told us. 'Why?' he was asked. 'Because that's where the concentrated work happens.' So, in terms of office design evolution, Ken Giannini's opening quip may be a little wide of the mark.